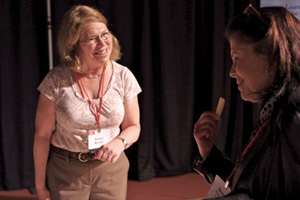 Horticulture professor Susan Brown, left, offers an apple sample to Bonnie Reichman ’76 and talks about three in-development apple varieties and a partnership formed exclusively with New York growers. Joe Wilensky/Cornell Chronicle. Barton Hall banquet celebrates public engagement mission [Cornell Chronicle 10/29/2012] – In an event that honored Cornell’s tradition of public engagement and its founding as a land-grant university, a dinner banquet at Barton Hall, “Cornell Now: Celebrating Our Land-Grant Mission,” was held Oct. 26 as part of the 62nd annual meeting of the Cornell University Council and the Cornell University Board of Trustees. The 600 attendees were treated to a new, seven-minute video, Cornell’s Land-Grant Mission and the Spirit of Public Engagement, which featured the on-camera creation of a large chalkboard mural by local artist Marshall Hopkins, charting Cornell’s historic land-grant founding and how that mission has evolved into the university’s global engagement today. View the video. Federal grants will fund study of food system, environment [Cornell Chronicle 10/29/2012] – How can farmers battle marmorated stink bugs in vineyards or late blight threatening a tomato crop? Can urban trees help mitigate climate change? What breeding programs will keep American crops competitive? Cornell faculty and extension educators will tackle these and other questions this year with $9 million in Federal Formula Funds from the U.S. Department of Agriculture’s National Institute of Food and Agriculture. Cornellians plan historic gardens for Harriet Tubman home [Cornell Chronicle 10/26/2012] – A collaborative project involving the Cornell Plantations and Cornell landscape architecture students focuses on planting for the future while preserving the past. Plantations staff and summer interns from Cornell have been creating plans for new gardens at the historic Harriet Tubman Home in Auburn, N.Y.
Honey, The Americans Shrank The Apple Trees [NPR’s The Salt 10/8/2012] – Adjunct professor in the Department of Horticulture Gennaro Fazio, a geneticist with the USDA’s Plant Genetic Resources Unit in Geneva, N.Y., explains the benefits of dwarfing including doubling or tripling apple yields compared to standard size trees. 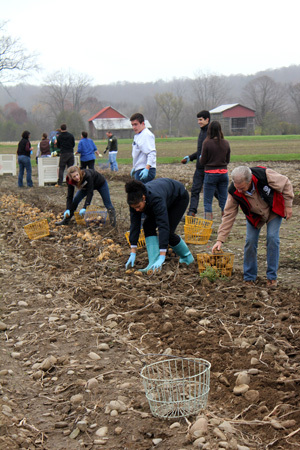 Yield from Freeville farm volunteers was no small potatoes [Cornell Chronicle 10/31/2012] – About 20 volunteers harvested about 5 tons of red and white potatoes at the Homer C. Thompson Vegetable Research Farm Oct. 27 for distribution to food aid programs. 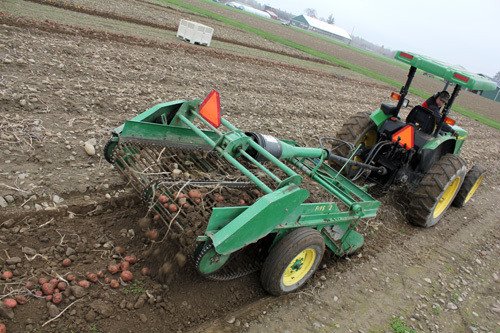 The potato gleaners were participating in Make a Difference Day, an annual day of volunteering established 22 years ago by USA Weekend Magazine. Pumpkin 2011 U.S. sales: $113 million [San Francisco Chronicle 10/29/2012] – Demand for pumpkins has risen since the late 1980s, with the emerging popularity of pick-your-own pumpkin farms across the country, according to Steve Reiners, an associate professor in horticulture at Cornell University in Ithaca, N.Y.
Robin Bellinder (right) and volunteers harvest potatoes for food aid programs at the Homer C. Thompson Vegetable Research Farm, Freeville, N.Y. Since 1998, the farm, run by the Cornell University Agricultural Experiment Station, has donated more than 1 million pounds of food. Farm manager Steve McKay digs potatoes ahead of the gleaners. New ways of seeing the plant genome with John Sanford, Courtesy associate professor, Department of Horticulture, Cornell University. Facilitating meaningful learning experiences with T. Grady Roberts, Associate professor, Global Education Lab, University of Florida. Research team tackles top pests that scourge organic crops [Cornell Chronicle 10/23/2012] – A $2 million grant from the USDA’s National Institute of Food and Agriculture Organic Agriculture Research and Extension Initiative will fund a four-year project that will allow an interdisciplinary team of eight Cornell breeders, plant pathologists, entomologists, economists and extension specialists to to breed robust, high-quality cucumber, melon and squash open-pollinated cultivars with tolerance to cucurbit downy mildew, reduced attractiveness to striped cucumber beetles and resistance to aphid-vectored viruses. “Since 2003, the acreage devoted to pickling cucumbers has declined by 20 percent as a direct result of the cost and risk associated with downy mildew,” said Michael Mazourek (above), principal investigator for the project. Mazourek has joint appointments in Plant Breeding and Genetics and Horticulture. Scientists aim to sustainably outsmart ‘super weeds’ [Cornell Chronicle 10/23/2012] – Diverse integrated weed management (IWM) strategies prevent the evolution and spread of glyphosate-resistant weeds. “Prevention involves killing weeds with multiple modes of action, and preventing movement of any potentially resistant weeds from field to field, or from field margins into fields,” says associate professor Thomas Bjorkman (right). Integrated weed management includes tactics such as cover cropping, mechanical cultivation, mowing, mulching, crop rotation and targeted herbicide application. Ryan’s research shows that using multiple IWM strategies is most effective for managing weeds. Bjorkman’s cover crop research has fueled development of two online decision tools that help farmers narrow down to a small number myriad choices for cover-cropping by situation. Bjorkman designed one tool for New York vegetable farmers; the other, developed in conjunction with the Midwest Cover Crops Council, covers several states with an emphasis on field crops. Program has $9 million to develop better grapes [Cornell Chronicle 10/24/2012] – VitisGen, a multidisciplinary research project co-led by Cornell grape breeder Bruce Reisch (right), will soon provide breeders tools they can use to develop more and better varieties. The project is a collaboration among 25 scientists from 12 institutions, including all of the nation’s public grape breeding programs. Their primary goal is to map unique snippets of DNA in the grape genome — called markers — to certain traits, such as cold-hardiness, fruit weight and disease resistance. Once these marker-trait linkages are found across 18 different grape-breeding populations, breeders can use them to streamline hybrid selection and ultimately the release of new grape varieties. When you’re planning what annual flowers to grow in your garden or containers next season, check out the 2012 gallery at the Bluegrass Lane Annual Flower Trials website. Last year was the ninth season of testing new and soon-to-be-released varieties. 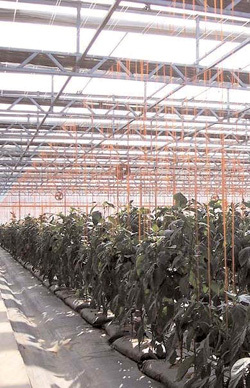 This information is used by the industry to develop better plants for consumers. Better plants mean happier customers, and potentially more sales. The research is led by Bill Miller, with trial garden coordinator Melissa Kitchen and crew of summer interns. They evaluated 206 varieties from nine companies in 2012. Unmulched (left) and mulched pansies and violas in the overwintering trials. 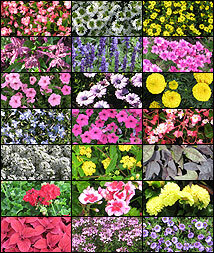 View top-rated plants from 2012 trials. And if pansies are in your plans, also see our new report on the Pansy and viola overwintering trial. 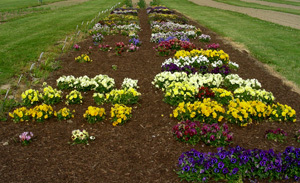 We tested nearly 100 varieties of pansies and violas to see which overwintered best — both mulched and unmulched. CALS will continue to evolve its education program [Cornell Chronicle 10/19/2012] – Reaccreditation for the Master of Arts in Teaching (MAT) will not be pursued when the current accreditation expires Dec. 31, 2013. “We are committed to ensuring that our current students have every opportunity to certify as teachers,” said Travis Park (right), director of the Cornell Teacher Education Program (CTE), based in the Department of Horticulture. 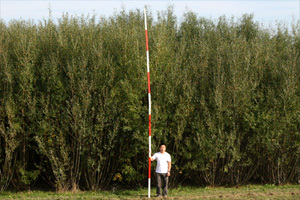 Cornell plays big role in Northeast biofuel project [Cornell Chronicle 10/17/2012] – Cornell is playing a major role in the Northeast Woody/Warm-season Biomass Consortium (NEWBio), a research and education project led by the Pennsylvania State University that seeks to develop perennial feedstock production systems and supply chains for shrub willow and such warm-season grasses as switchgrass and miscanthus. “Our hope is that we will see expanded cultivation of renewable bioenergy crops that will stimulate rural agricultural economies and production of domestically produced biofuels,” said Larry Smart, a Cornell associate professor of horticulture and a co-principal investigator (co-PI) of the project. Evolution of the Land Grant Mission – Feature story quotes Anu Rangarajan: “Our Northeast Beginning Farmers Project offers interactive, online courses on topics for those just beginning to think about farming—such as ‘Square One’ and ‘Markets and Profits’—to more advanced courses on marketing and financial planning that benefit even more experienced farmers. I’ve been impressed by the inspiration and enthusiasm for agriculture in the small-farms community.” Erica Frenay ’98, coordinator of the project and is pictured displaying a brood of bees on her family’s Shelter Belt Farm in Brooktondale, N.Y. The article also lauds “innovations like the compaction-resistant soil mix for street tree roots developed by horticulture professor Nina Bassuk [that] have brought science to sidewalk shade,” and features a sidebar on The Land Grant Mission and Democracy by Scott Peters. Geneva Summer Research Program Brings Science Careers into Focus – Since 2009, the Geneva Summer Research Scholars program has grown from eight students to 28, boasts three Cornell graduate students who were former scholars, and is self-sustaining thanks to participation from the Departments of Horticulture, Entomology, and Plant Pathology and Plant-Microbe Biology. Goodness Grapeness! Student-Run Vineyard is Certified Organic – The planting of about 500 grapevines – enough to produce over 200 cases of wine – is used in the course Sustainable and Organic Grape and Wine Production taught by assistant professor of viticulture Justine Vanden Heuvel and food science lecturer Kathy Arnink. Plantations Pilot Program Aims to Cure ‘Plant Blindness’ – “Our goal is to engage local high school students in a participation-based program that will raise ecological awareness and teach skills that will cultivate an environmental ethic for future actions,” says Donna Levy ’81, environmental education outreach coordinator at Cornell Plantations. Outstanding Faculty Awards – Marvin Pritts and Susan Brown are recognized. Download .pdf version or view digital magazine format. October 15, 2012, three students from the Art of Horticulture class at Cornell University create outfits made from plant materials — and tell a story. Read more about the show in the Cornell Chronicle [10/16/2012]. 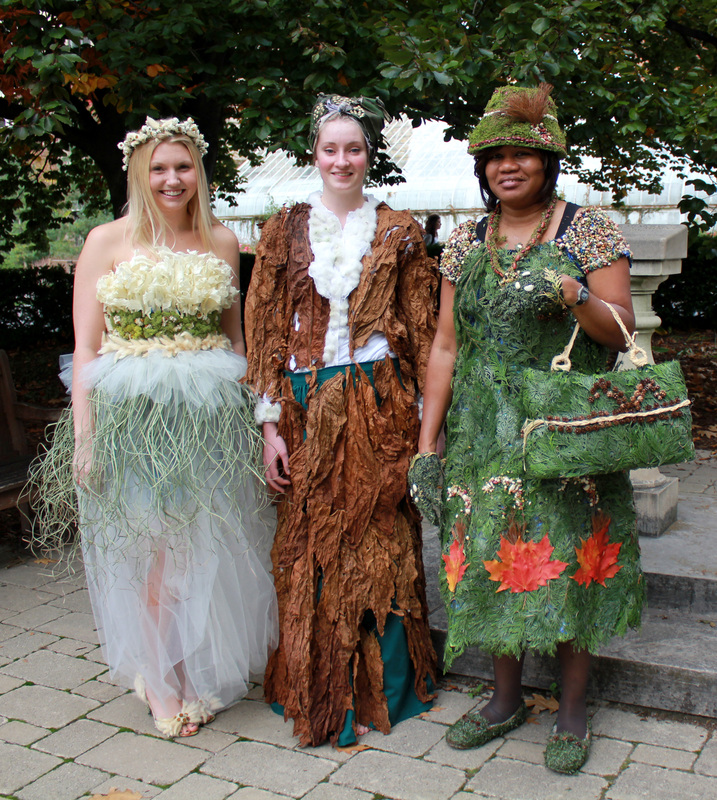 Art of Horticulture students and their creations: Jasmine LaCoursiere ’14, wedding dress fashioned from bleached oak leaves, mosses, and grass leaves and seedheads. 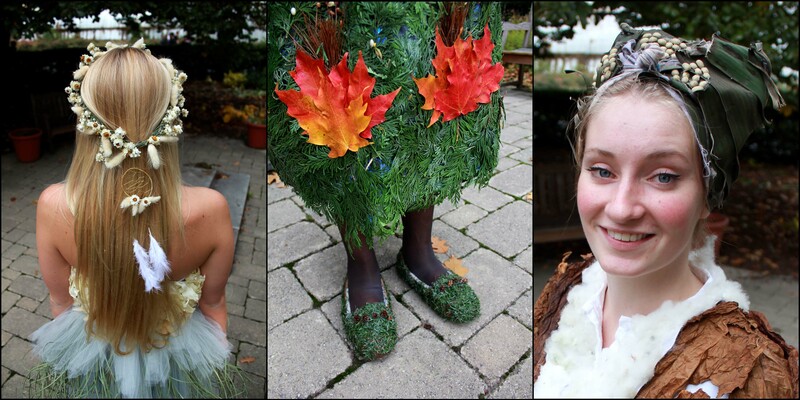 Eva Johnson ’15, globally important crops featuring tobacco and banana leaves, cotton and coffee beans. 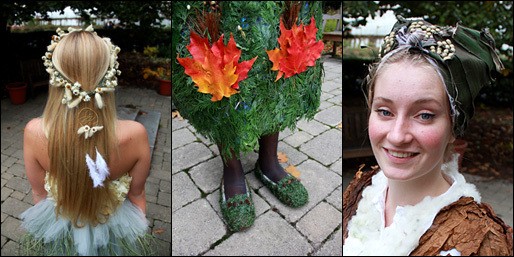 Shiela Gordon-Smith ’14, Queen Mother outfit made from a diversity of evergreens, seeds, grass, and maple leaves. Fee: $100 per person registered & paid by 11/16/12 $130 per person after 11/16/12 Program details and registration. Scott J. Peters (right) will give a public lecture about the Morrill Act, the basis 150 years ago of Cornell’s founding as a land-grant university, Oct. 18 at 4 p.m. in 2B48 Kroch Library. Free. 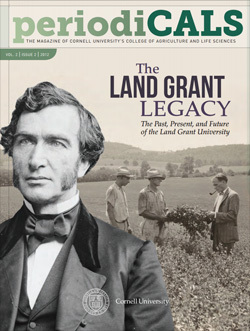 His talk, The Vision of the True Prophets: Founding and Contemporary Interpretations of the Land-Grant Mission, will draw from his study of Justin Smith Morrill’s and Jonathan Baldwin Turner’s speeches and writings, and the views and experiences of contemporary faculty and staff at Cornell and other land-grant institutions. Peters is an associate professor of horticulture at Cornell, a professor of cultural foundations of education at Syracuse University, co-director of the consortium Imagining America: Artists and Scholars in Public Life (http://imaginingamerica.org) and a faculty affiliate for the Program for the Advancement of Research on Conflict and Collaboration at the Maxwell School of Citizenship and Public Affairs.